Per Håkan Gessle (Swedish pronunciation: [pɛːr ˈɡɛs.ˈlɛ]; born 12 January 1959) is a Swedish pop singer-songwriter, guitarist, and harmonicist. He is the lead singer of the Swedish pop group Gyllene Tider and formed Roxette with Marie Fredriksson (Gessle being the chief songwriter in both bands). With Fredriksson's illness in 2002, he went back to recording solo albums, reformed Gyllene Tider in 2004 and became a successful artist in his native Sweden, selling multi-platinum albums. Per Gessle was a founding member of Gyllene Tider, in 1976. They quickly became a popular group in Sweden, but after their fourth album, The Heartland Café (1984), sold poorly compared to their previous albums, the group disbanded. Gessle wrote. "We decided to put Gyllene Tider to rest... until further notice." In 1982, Gessle released his first solo album, Per Gessle and after Gyllene Tider split-up his second album, Scener, quickly appeared in 1985. Gessle and Marie Fredriksson had been friends for a few years before they came together as Roxette in 1986. After the success of their first hit "Neverending Love", which was written by Gessle, they quickly recorded Pearls of Passion using material which was originally intended for Per's third solo album. Roxette went on to achieve four U.S. #1's and two #2's, with their albums Look Sharp! and Joyride attaining platinum status in a number of countries. After Roxette's early nineties success, Per released a demo compilation album in 1992, På väg, 1982–86. After the release of Crash! Boom! Bang! and subsequent world tour, Roxette took a break. 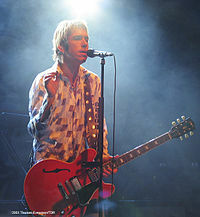 In 1996, after a reunion and subsequent tour of Gyllene Tider, Gessle recorded his first English solo album, using Brainpool and Gyllene Tider as backing musicians. Christoffer Lundquist from Brainpool would also come to collaborate with Per on later releases. The World According to Gessle, released in 1997, produced three singles, "Do You Wanna Be My Baby? ", "Kix" and "I Want You to Know". The videos to all three songs were directed by Jonas Åkerlund. The World According to Gessle was re-released in 2008, with extra bonus material and demos. In 1997 Hjärtats trakt – en samling was released as a best-of album. After Roxette released Have a Nice Day (1999) and Room Service (2001) to moderate success, Per continued with his solo work. The subsequent album Mazarin (2003), was very successful in Sweden, going five times platinum in 2004. His first album involving singer Helena Josefsson brought Gessle numerous awards; four Grammis awards: Best Artist, Best Male Pop Performer, Best Composer and Best Song. He also won three Rockbjörnen awards: Best Swedish Male Artist, Best Swedish Album and Best Swedish Song — and a Guldälgen (The Golden Moose) Award for Best Song. The song "Här kommer alla känslorna (på en och samma gång)", is Gessle's most successful release in Sweden, spending two months at No. 1, while gaining platinum status. Also in 2004, saw Gessle and Gyllene Tider reunited for a 25th-anniversary celebration that included the band's first album in 20 years, Finn 5 fel!, and another very successful tour in Sweden. They beat the Ullevi stadium attendance record, which was later broken by fellow Swede Håkan Hellström in 2016 (70,144), and the band played to almost half a million fans. As a result, the group was honoured with four awards in Sweden. With Son of a Plumber, he continued his association with other Swedish artists. Jens Jansson along with previous collaborators Josefsson and Lundquist, helped Gessle create his second English album. Released in November 2005, the album contains all of Gessle's musical heritage. His father was a plumber and the 2-disc album contains a song dedicated to him, "Kurt – The Fastest Plumber in the West". In Sweden, the album sold platinum on the first day of release. The album was also released in several other European countries in April 2006. In June 2007, he released another solo album in Swedish with the name En händig man, which shipped three times platinum. A single of the same name was released; "En händig man". Later on October a book of "Att vara Per Gessle" was published, telling some of the unknown facts about Gessle and his 30-year career. In late 2008, Gessle released Party Crasher, his seventh solo album and third in English. The first single off the album "Silly Really" was released on 29 October 2008 and achieved critical acclaim from Expressen, calling Per a "pop genius". After that, Gessle started his Party Crasher Tour, where Marie Fredriksson joined him on stage twice, in Amsterdam and Stockholm. This was eight years after their last live performance together during Roxette's Room Service Tour in 2001, and after Fredriksson had recovered from a brain tumor discovered in 2002. Following Fredrikssons guest appearance in Amsterdam, Roxette started to perform live again. Initially this was during the Night of the Proms concert series in Belgium, the Netherlands and Germany in 2009, later followed by extensive concert tours in 2010, 2011 and 2012, performing over 100 shows on all 6 continents. In the summer of 2013, Gessle reunited with his first band Gyllene Tider once more, performing some 20 shows in Sweden for an audience totalling about 300,000 people. In 1990 Per Gessle wrote a single, "The Sweet Hello, The Sad Goodbye", for Thomas Anders (of Modern Talking fame); Roxette would release their version as the B-side of their single "Spending My Time". He has also participated with the Swedish singer Nisse Hellberg in the project The Lonely Boys. In 1996 he worked with Belinda Carlisle and wrote two songs for her album, A Woman and a Man; "Always Breaking My Heart" and "Love Doesn't Live Here". The former was released as a single, becoming a UK top 10 hit. Gessle also recorded a demo song for Carlisle, called "Liberty", which also was intended for the same album, but Carlisle turned down, asking for something more guitar-oriented. So Gessle came up with "Always Breaking My Heart". Gessle also serves as the guiding creative force for Nordic Rox, Sirius XM Radio's exclusive Scandinavian music show. In early 2009, Gessle along with music journalist Sven Lindstrom, hosted a two part special celebrating the 100th episode of "Nordic Rox", showcasing the 50 best Swedish songs of all time. Gessle is one of three people (also including Björn Ulvaeus) who own NoteHeads, a Swedish company which publishes the music notation program Igor Engraver. Along with Björn Nordstrand he also owns a hotel in Tylösand. He married his long-time girlfriend Åsa Nordin in 1993 at Västra Strö Church, Eslöv, Sweden. The wedding reception was held in nearby Trollenäs Castle. They have a son, Gabriel Titus, born on 5 August 1997. For Gessle's releases with Roxette, see Roxette discography. For Gessle's releases with Gyllene Tider, see Gyllene Tider. 1983: "Om du har lust"
1986: "Inte tillsammans, inte isär"
^ "The Heartland Café 1990 re-release CD liner notes". gyllenetider.eu. Retrieved 2009-02-10. ^ "Pearls of Passion album re-release introduction by Gessle.". pergessle.net. ^ a b c d e f "Regler för Guld och Platina vid digital försäljning" (in Swedish). IFPI Sweden. Archived from the original on 11 February 2009. Retrieved 2013-01-29. ^ "Aftonbladet's report on Grammis awards". Aftonbladet. Retrieved 2009-02-10. ^ "Grammis award winners archive" (PDF). ^ a b Search:Per Gessle, Swedish Charts Portal. ^ "Så många såg Bruce på Ullevi i kväll". Retrieved 2016-07-27. ^ "Expresson review of 'Silly Really' (In Swedish)". Expressen. ^ a b "Gessle's official homepage". Retrieved 2009-02-10. ^ Alpine Skiing – SiriusXM Radio. Sirius.com. ^ "Igor Engraver". Noteheads.com. Archived from the original on 13 March 2008. Retrieved 2013-01-29. ^ Hermele, Bernt (25 July 2004). "Halmstads affärskung" [Halmstads Business King]. Dagens Nyheter. Retrieved 2012-07-19. ^ a b c d Search:Per Gessle. Swedish Charts Portal. ^ Search:Per Gessle. Norwegian charts portal. Wikimedia Commons has media related to Per Gessle. "Do You Wanna Be My Baby?" "Här kommer alla känslorna (På en och samma gång)"
"Tycker om när du tar på mej"
"I Like it Like That"
"Jag skulle vilja tänka en underbar tanke"
"Pratar med min müsli (hur det än verkar)"
Don't Bore Us, Get to the Chorus! A Collection of Roxette Hits: Their 20 Greatest Songs! All Videos Ever Made & More! "Fading Like a Flower (Every Time You Leave)"
"She Doesn't Live Here Anymore"
"No Sé Si Es Amor"
"The Centre of the Heart"
"Milk and Toast and Honey"
"She's Got Nothing On (But the Radio)"
"It Must Have Been Love"
GT 25 - Samtliga hits! En scen vid en plats i en stad - GT25 Live! "Himmel No. 7" / "Flickorna på TV2"
"Ska vi älska, så ska vi älska till Buddy Holly"
"När vi två blir en"
"(Kom så ska vi) Leva livet"
"Ljudet av ett annat hjärta"
"Flickan i en Cole Porter-sång"
"En sten vid en sjö i en skog"/"Tuffa tider (för en drömmare)"
"Jag borde förstås vetat bättre"
"När alla vännerna gått hem"
This page was last modified on 10 October 2016, at 01:45.